Toys for baby and toddler. 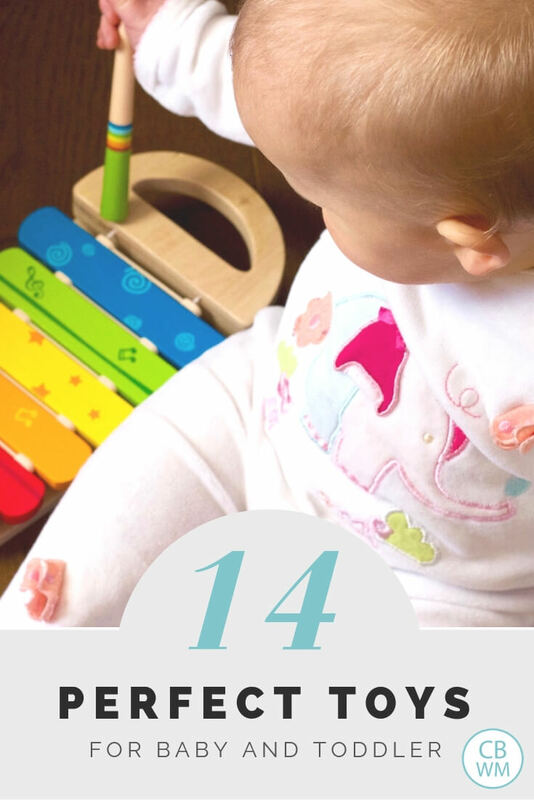 14 toy ideas that are perfect for the baby age range and toddler age range. I am positive that once I post this, I am going to think of more toys my kids love, but here I go. Before I mention which toys my kids have absolutely loved, I want to point out that there are so very many toys available out there. It is quite shocking to me that Brayden can go to a friend’s house and find that there are few if any toy duplicates. There are many, many good toys out there. When it comes time for Christmas and birthdays, I spend a lot of time planning out the toys we will get the children. I don’t just buy things I think look cute or fun. My husband has often remarked that he can really see the time and effort I put into getting a good variety of toys. I think of things I want them to learn and research what types of toys contribute to skills they should be practicing for the age. Here are toys that my children have absolutely loved. LeapFrog. I have to just say that I have never purchase a LeapFrog product that my kids have not absolutely loved. I have also found them to be very educational. I love their pop-up toys, their refrigerator magnets, their puzzles, their educational videos, and more. Trucks/Cars/Tractors. One of Brayden’s favorite toys (and actually Kaitlyn’s, too) has been trucks, cars, and tractors. He really likes John Deere tractors, but there is no shortage of possibilities out there. I don’t think Brayden really cares. Fisher Price Little People. I know these were my some of my favorite toys growing up, and the same is true for my husband. Both children also love them. Some favorites are the fire truck, the barn, the garage, the pet shop, the airport (no longer made but can be found online), and the house. If you are interested in these toys, think of the special interests of your child and get sets that go along with that interest. Keep in mind that different sets are sold at different stores (what you find at Shopko won’t necessarily be found at Target). You can find a lot of these sets on Amazon.com or ebay. My favorite place to look is the Fisher Price website. It is not extremely intuitive and the search function doesn’t work well. Also, I have found that going through different options takes me to different pages on the site. If you find something you like, I suggest you bookmark it because it can be hard to find again. Dolls and Stuffed Animals. Kaitlyn absolutely loves her dolls and stuffed animals (her “babies”). These were favorites of mine also. Legos. The kids both love to play with Legos. We have the large kind right now. Thomas. Brayden really loves Thomas the Tank Engine toys. Push Along Toy. Both kids loved their toy that you push while they were learning to walk. Links. 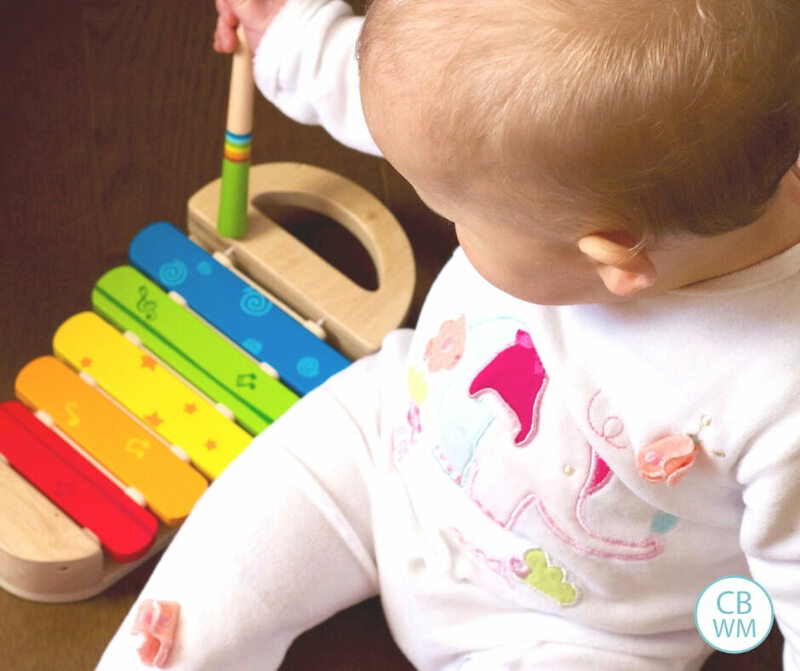 This toy is a great toy on its own, but it also works great to secure toys to the car seat or stroller, especially during the period where baby loves to throw the toys out. Here is the link: Toy links. That is probably good enough. I figured as we approach Christmas shopping season it would be fun to share some of our favorite toys (or, uh, our kids favorite toys). Please share toys your kids love. My son loves his toy lawn mower. I picked one up at a garage sale for 50 cents, and it is his favorite toy of all. Joanna, good call! My son loves that too. I didn’t even think about outside toys! I will have to do an “outside toy” post. Thanks Becca! My son loved his jumperoo too. Thanks Mommytoisabella. Those cell phones are a hit. Nate (age 2) loves all his cars, trucks, trains…basically anything with wheels. He also loves his legos and recently, a Little Tikes art board that has a magna doodle with stamps on one side and a chalkboard on the other. You can secure paper to the chalkboard so they can color. It has a handle and a case to hold the chalk/crayons so Nate can carry it with him wherever we go. Denise, Thanks! I have always wondered about those easles. They look fun. Today I was just thinking that a company needs to make a set of play keys that resemble real ones. I will look into ordering some. So good to know!! thanks Emily! I had actually typed keys down, but then I couldn’t find a link to the ones we have anywhere. We have the little tykes keys that have keys plus buttons you push (alarm, unlock, etc.) that make noises. Thanks for mentioning Parents brand also. We have a few Parents toys and they are all hits. Valerie…Thank you for the advice on toys. I have been contemplating what to buy my 5 month old for Christmas. I love the Leap Frog Learn and Groove music table idea. A good place to find toys like this, if you don’t mind used toys, is ebay. I have found great things for half the price! Does anyone know of a pretend cell phone that actually looks like a phone? Kids know the difference, and the plastic ones (like the key example above) just don’t cut it!Thanks! Rachel, the closest I’ve seen is by the same brand that makes the keys, the Parents brand (at Target). It’s not exact by any means, but best I know. maybe there are cell phone toys made for older kids that are closer to the real thing??? not sure how safe they would be for younger kids. Thanks becca, I’ll take a look at target. I have a question…I keep reading all of this stuff about ‘activity boards’ and how my 8 month old needs to have one. Problem is, I don’t know what they are, and I can never find anything that’s like an ‘activity board’. Any thoughts or clarifications on what these are and where to find? Bradysmom, I am not sure. I haven’t read anything about that. I looked it up on Amazon.com and saw some different things. You might try a search there for ideas. Just wondering if you know of any good websites or resources that compare toys, do toy reviews, etc. I’m trying to plan for Christmas shopping now. Thanks! B.B., I am late in responding, sorry I didn’t see your question until now. What I do when looking for reviews is usually look it up on Amazon.com. People leave their reviews there. I will also go to the manufacturer website and see if they have reviews. Some stores like babiesrus.com have reviews online there also. Read what they have to say and take them for what they are worth.